Fyodor Ivanovich Tyutchev (Russian: Фёдор Иванович Тютчев) (December 5 [O.S. November 23] 1803 - July 27 [O.S. July 15] 1873) is generally considered the last of three great Romantic poets of Russia, following Alexander Pushkin and Mikhail Lermontov. Tyutchev was a Slavophile, who glorified things Russian while despising the Western influences in his country that had begun with Peter the Great and continued well past his lifetime, through the nineteenth century until the Russian Revolution of 1917. The internal tension between the Slavophiles and the Westernizers would characterize much of the nineteenth-century Russian discourse. However, the Slavophile position, which included the notion of Moscow as the "Third Rome" and held that Russia would be great precisely because it was something of a blank slate that had not yet contributed something significant to world culture, proved to be naive. Tyutchev was born into an old noble family in Ovstug near Bryansk. His childhood years were spent in Moscow, where he joined the classicist academy of Professor Merzlyakov at the age of 15. His first printed work was a translation of Horace's epistle to Maecenas. From that time on, his poetic language was distinguished from that of Pushkin and other contemporaries by its liberal use of majestic, solemn Slavonic archaisms. His family teacher was Semyon Raich, one of the first Russian experts in German philosophy; it was Raich who imparted to Tyutchev a taste for metaphysical speculations. In 1819-1821, Tyutchev attended Moscow University, where he specialized in philology. In 1822 he joined the Foreign Office and accompanied his relative, Count Ostermann-Tolstoy, to Munich. He fell in love with the city, remaining abroad for 22 years. Yesterday I felt a moment of burning emotion due to my meeting with Countess Adlerberg, my dear Amalie Krüdener who wished to see me for the last time in this world and came to tell me good-bye. In her person my past and the best years of my life came to give me a farewell kiss. It was also in Munich that Tyutchev met his first wife, Bavarian countess and widow of a Russian diplomat Emilia-Eleonora Peterson, who maintained a fashionable salon frequented by the likes of Heinrich Heine and Friedrich Wilhelm Joseph von Schelling. Upon her death, Tyutchev married Ernestina Dörnberg, née Countess von Pfeffel, who had been his mistress for six years and had a child by him. Neither of his wives understood a single word of Russian. This is hardly surprising, however, as French was the language of the Russian aristocracy in the nineteenth century, and Tyutchev spoke French better than Russian. All his private correspondence was Francophone. In 1836 the "Jesuit" Prince Gagarin obtained from Tyutchev a permission to publish his selected poems in Sovremennik, a literary journal edited by Alexander Pushkin. Although appreciated by the great Russian poet, these superb lyrics failed to spark any public interest. For the following 14 years, Tyutchev didn't publish a single line of poetry. He wrote several political articles, though, which were published in Revue des Deux Mondes. These articles brought him in touch with the diplomat Prince Gorchakov, who would remain Tyutchev's intimate friend for the rest of his life. In 1837 Tyutchev was transferred from Munich to the Russian embassy in Turin. He found his new place of residence uncongenial to his disposition and retired from the service to settle in Munich. Upon leaving Turin it was discovered that Tyutchev had not received permission to leave his post, and was officially dismissed from his diplomatic position as a result. He continued to live in Germany for five more years without position before returning to Russia. Upon his eventual return to Saint Petersburg in 1844, the poet was much lionized in the highest society. His daughter Kitty caused a sensation, and the novelist Leo Tolstoy wooed her," almost prepared to marry her impassively, without love, but she received me with studied coldness," as he remarked in a diary (he would name one of his heroines in Anna Karenina after her). Kitty would later become influential at Pobedonostsev's circle at the Russian court. As a poet, Tyutchev was little-known during his lifetime. His three hundred short poems are the only pieces he ever wrote in Russian, with every fifth of them a translation of other works. Tyutchev regarded his poems as bagatelles, not worthy of study, revision or publication. He generally didn't care to write them down and, if he did, he would often lose the papers on which they were scribbled. 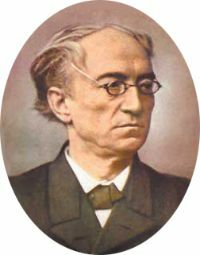 Nikolay Nekrasov, when listing Russian poets in 1850, praised Tyutchev as one of the most talented among "minor poets." It was only in 1854 that his first collection of verse was printed, prepared by Ivan Turgenev, without any help from the author. In 1846 Tyutchev met Elena Denisyeva, over twenty years his junior, and began an illicit affair with her. Having born three children to the poet, she succumbed to tuberculosis, but a small body of lyrics dedicated to Denisyeva is rightfully considered among the finest love poems in the language. Written in the form of dramatic dialogues and deftly employing odd rhythms and rhymes, they are permeated with a sublime feeling of subdued despair. One of these poems, The Last Love, is often cited as Tyutchev's masterpiece. In the early 1870s, the deaths of his brother, son, and daughter greatly affected Tyutchev, leaving him partly paralyzed. He died in Tsarskoe Selo in 1873 and was interred at Novodevichy Monastery in Saint Petersburg. The rest of his poems, whether describing a scene of nature or passions of love, put a premium on metaphysics. Tyutchev's world is dualistic. He commonly operates with such dualities as night and day, north and south, dream and reality, cosmos and chaos, the still world of winter and spring teeming with life. Each of these images is imbued with specific meaning. Tyutchev's idea of night, for example, was defined by critics as "the poetic image often covering economically and simply the vast notions of time and space as they affect man in his struggle through life." In the chaotic and fathomless world of "night," "winter," or "north," man feels himself tragically abandoned and lonely. Hence, a modernist sense of frightening anxiety permeates his poetry. Unsurprisingly, it was not until the twentieth century that Tyutchev was rediscovered and hailed as a great poet by the Russian Symbolists such as Andrei Bely and Alexander Blok. This poem inspired two early twentieth-century composers, Georgi Catoire (the setting of the poem in the song “Silentium”) and Nikolai Medtner (the Night Wind piano sonata (#7) of 1911). While the title of Nikolai Myaskovsky's 1910 tone poem, "Silence," may have been borrowed from Tyutchev, the inspiration is credited to Edgar Allan Poe's "The Raven," according to the original reference on Myaskovsky's life and works by Alexei Ikonnikov (Philosophical Library, 1946). The same poem was also set to music by the twentieth-century Russian composer Boris Tchaikovsky (1925-1996) in his 1974 cantata "Signs of the Zodiac." ^ Literaturnoe nasledstvo 97: Fyodor Ivanovich Tyutchev. Nauka, 1988. This page was last modified on 16 May 2017, at 19:18.